Dannnm Nigel’s dad is a jerk. 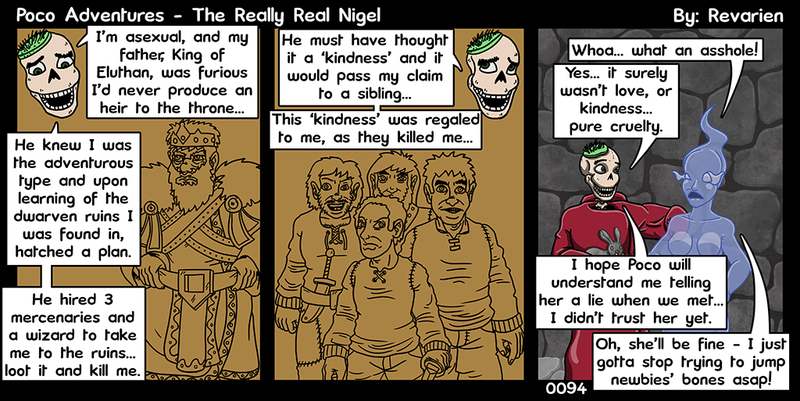 Panel 2 has the same dudes from The Real Nigel – 0006, cept the Wizard in the back… he’s the one that got away, sealing Nigel’s raging zombie-self in the magical room after they stabbed him with the dagger (that’s should be pretty well inferred at this point, but it may become even more on the nose than this, later a ways down the line). The King’s plot makes no sense whatsoever. There have been many occasions in history where a throne was passed on to a nephew, sometimes even without any infanticide. I think there are other machinations at work here. But the first thing to divine here should be whether Nigel is still the heir apparent to the throne of Eluthan. He doesn’t seem to be the regal type at all. I take it the Outrunner Outpost is part of the domain of Eluthan. Except they are more likely to pay taxes to Queen Sultrah. That situation may cause a war.